Matt Carter picked up the 2nd last-place finish of his NASCAR Nationwide Series career in Friday’s Bubba Burger 250 at the Richmond International Raceway when his #68 Morro’s Truck & Welding Chevrolet fell out with a vibration after he completed 6 of the race’s 251 laps. Owned by Craig Partee, but now run in association with Rick Ware, the Fleur-De-Lis team made its first series attempt last July at Daytona when the next-generation Nationwide car was introduced. The team missed that race, but made two other next-gen races in 2010 with Carl Long, who brought the team its best finish of 31st at Michigan in August. This year, however, the team has yet to finish better than 39th, having never completed more than 12 laps of all six races they have made this year. The early stages of the race saw Nashville last-placer Johnny Chapman’s #75 fall to the rear early along with 2010 driver Carl Long, now in Rick Ware’s #41. Carter followed Jeff Green to the garage area on Lap 7, and when both Chapman and Long returned to the track, Carter ended up with his first last-place finish of the season. Chapman finished 39th while Long came home 35th after 28 laps. *Carter was the fifth-straight last-place finisher to fall out due to a vibration. This is the longest streak of Nationwide drivers falling out for the same reason since 2005, when eight consecutive drivers finished last due to crashes at Texas, Phoenix, Talladega, Richmond, Darlington, Charlotte, Dover, and Nashville. 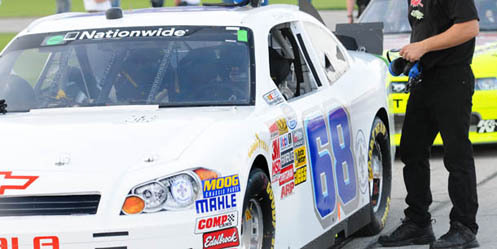 *The #68 had not finished last in a Nationwide race since 2004, when Rick Markle scored his first career last-place finish in the 2004 Aaron’s 312 at Talladega when his www.UnfinishedFurnitureDirect.com Chevrolet owned by Del Markle fell out with handling problems after 30 laps. *Carter’s only other last-place finish in the Nationwide Series came last August at Watkins Glen, driving a points-exempt second MacDonald Motorsports Dodge, #82.